The Gili Islands, located in the northwest of Lombok, has long been reputed as one of the best backpacking destinations in Indonesia. This archipelago comprised of three islands, with Gili Trawangan being the largest and most popular among tourists. They possess pristine natural beauties such as clear blue waters, exotic coral reefs, and white sandy beaches, untouched by the modern civilization. Due to their popularity, the economic growth and expansion have finally caught up with them, creating more glamorous business and tourist spots. The Gili Trawangan has the most urbane and suave atmosphere compared to the other two. You can easily find a trendy bar in here, as well as modern resorts and restaurants. The party scene in Gili Trawangan at the moment is flourishing, almost similar to Bali. This is what makes the Gili Trawangan known as the party island. Meanwhile, Gili Meno is a popular retreat for couples and Gili Air is the heaven for social backpackers. All three islands are visible from the neighboring mount Rinjani in Lombok or even from Bali when the weather is clear. There are so many engaging activities for tourists to partake in Gili Trawangan. The island itself is not too big so visitors could encircle it easily. Since there are no motorized transports in the Gili Islands, visitors could use alternative transports such as bikes and cidomos. 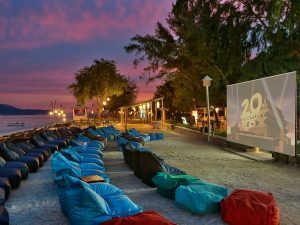 Here are some top things to do while you are in Gili Trawangan. The ultimate thing to do in here is obviously scuba diving. The beauty of their underwater life is what makes Gili Trawangan famous in the first place. Explore many renowned diving spots around the island such as the Manta Point or Shark Point. Every diving spot in Gili Trawangan is suitable for all levels of diver, from the beginner to the instructor-level. 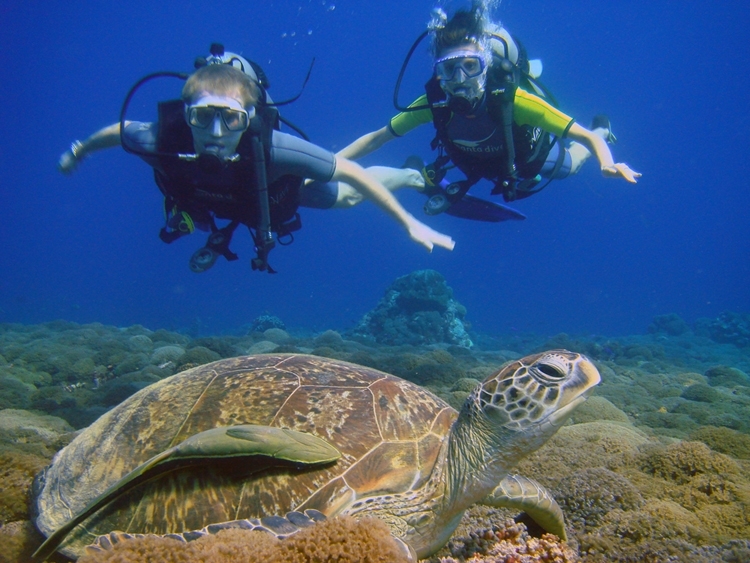 This fact, combined with the impressive array of marine biodiversity, provides a great learning center for scuba divers. For people who never go scuba diving before, there are many diving courses around the island. Some of the diving schools offer an online course which allows visitors to learn and master the diving theory prior to arriving. If scuba diving is not for you, then try snorkeling instead. 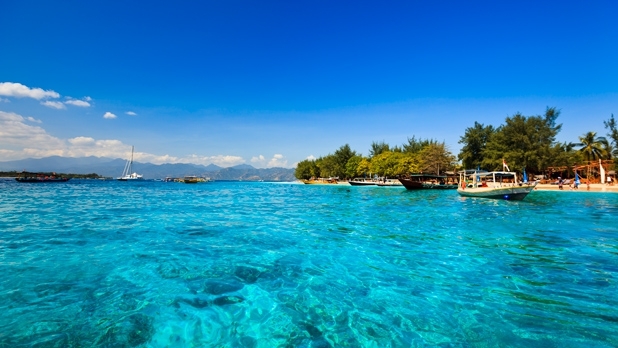 The shores of Gili Islands provides an excellent spot for swimming and snorkeling. 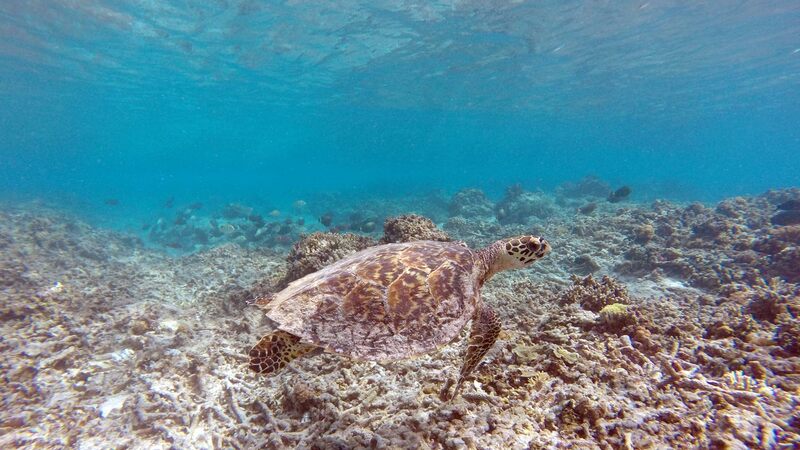 You can even swim with turtles as well as beautiful pelagic fishes in some places. You will ove to visit Bounty Wreck and Biorock. 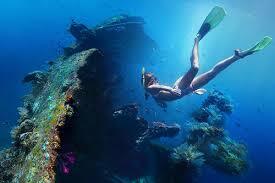 Snorkeling provides the opportunity to swim around the corals in shallow waters. 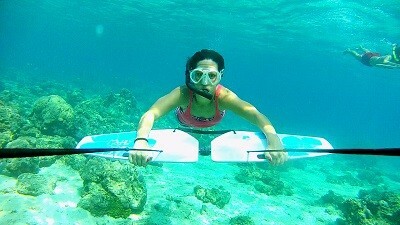 You can rent the snorkeling equipment anywhere on the beach or at the dive shops. Most of the snorkeling tour includes a trip to several snorkeling spots starting at 10 AM and ends at 4 PM. Don’t forget to wear flippers as the current is pretty strong. Even if you are a strong swimmer you might find a hard time swimming against the currents. Bicycle rentals are available almost everywhere on the island, so visitors should have an easy time finding them. 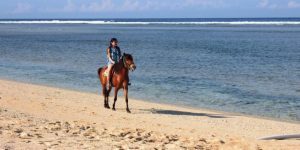 You can then leisurely ride along the coast and circumnavigate Gili Trawangan. Enjoy the refreshing sea breezes and exotic view while pedaling through the pathways. Since the climate is pretty hot, this is a great way to catch some wind. The road can be bumpy at times with some rocks lying around, so please pay attention to the road and don’t speed too much while cycling to avoid any injuries. 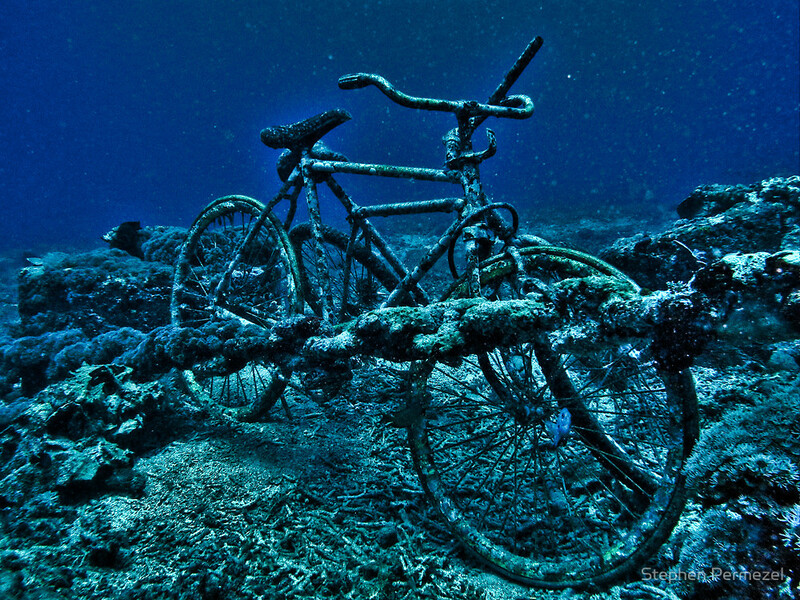 Nevertheless, if cycling around the road is way too mainstream, then you may check out this old underwater bicycle. This location is in Bounty Wreck. 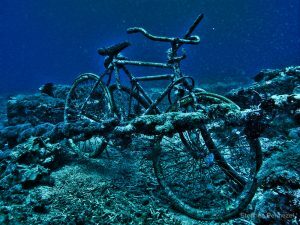 Well, you may ride your bike with the nemos fish and sharks. As there are a lot of pelagic fishes around the area, fishing is one of the top favorite things to do in Gili Trawangan Lombok Indonesia. There are several fishing tours available that offers trolling and deep-fishing service. Fishes such as giant trevally, mackerel, marlin, sailfish, tuna, mahi-mahi, barracuda, and other reef fish are commonly caught in this area. Manta rays, dolphins, and whales are also frequently sighted, although it is forbidden to catch them. For another experience, some tours also feature spear-fishing using harpoons. You can buy a fish from the local fishermen or caught it yourself, and then create a barbecue party at the beach. There are several restaurants that provide accommodation for this kind of event, so you don’t have to prepare anything. Thus, eating seafood here is the best but it is also recommended to try some Gili’s local food or more Indonesian tasty dishes. Just enjoy the tasty fish barbecue while enjoying the nice, relaxing ocean view. Don’t forget to bring your friends and family to enjoy it together, the more, the merrier! 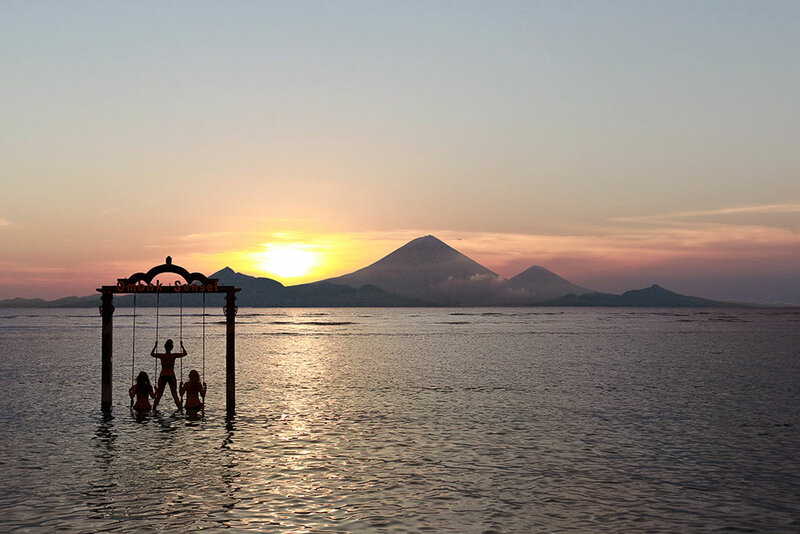 Gili Trawangan is arguably the best spot to see a sunset. Most travelers agree that the sunset seen from Gili Trawangan is the most beautiful sunset they ever see. The coloration is so The Bali Island and Mount Agung can be seen in the background, which adds a great significance to the already impressive scenery. There are many great spots around the island to catch a sunset. There are many resorts that built several swing and hammocks in the shallow water, and these are the perfect place to relax and enjoy the sight of the setting sun. Also, the picture beside is the view of Ombak Sunset beach in Gili Trawangan. The beach have swing play on the middle of the beach. Meanwhile, you play around the swing while enjoying the sunset with your only lover. It’s perfectly beautiful. Don’t forget that Gili Trawangan has two beautiful neighbors as well! You can take a boat trip to the neighboring Gili Meno and Gili Air. The boat leaves twice a day at a fixed time every day. Each island has their own specialties and features which surely appealing to every tourist. In Gili Meno, you can see various world-class resorts and beautiful beaches. This is why Gili Meno is more popular to young couples. In Gili Air, there are a lot of ethnic resorts which offers a more natural, traditional resorts and many cultural activities. Foreign backpackers are more fond of staying here for those reasons. Every location in Gili Islands provides amazing point-of-view to take some breathtaking and impressive photographs. Those who are fond of photography will find these islands is a true paradise on earth. From beautiful sunsets to magnificent pelagic fishes, almost everything in here is worthy to be taken picture of. Some of the resorts enhance this feature by building several objects that add aesthetical value to any picture. As well we can say, every spot of Gili Islands is worth to capture. As we can say it’s so Intragammable. So, for you who love hunting hot great beautiful pictures, then you may as well come here. Many places in Gili Trawangan provide the sea kayak to traverse the shallow waters around the island. The famous one is the one made from glass-like and transparent material to give an excellent view of the marine life underneath. It is a convenient way to explore the underwater life without ever getting wet. Don’t get too far from the island as the current is pretty strong and could sweep you away. 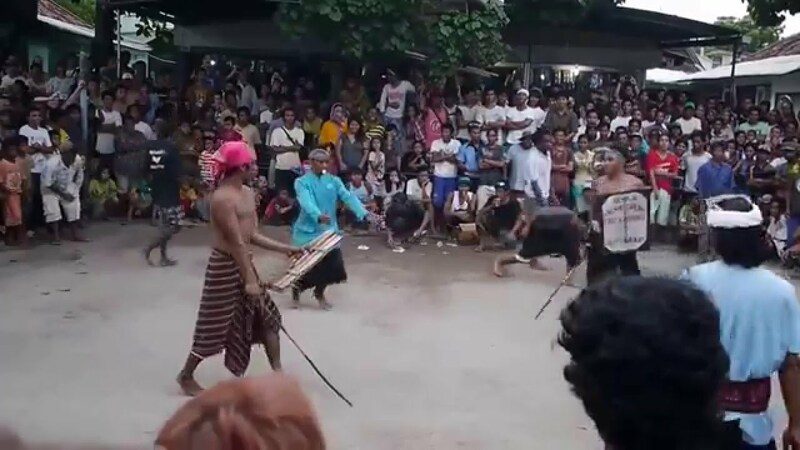 There is a traditional fight called “Presean” in the local Sasak language, where two fighters are pitted against each other and armed with sticks and shields. Although it may seem brutal at times, the participants of the fight actually have a good relationship with each other. The beautifully choreographed fight is incorporating some dance-like movements to make it more appealing. The fight always takes place on Sunday afternoon in the marketplace, so come early to get the best spot. 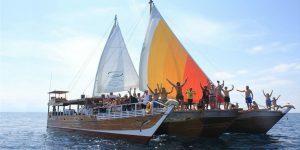 Southsea Nomads offer a great and unique partying experience in Gili Trawangan. Tourists and backpackers alike can hop aboard their boat and enjoy a great party trip while cruising along the coast. The party boat starts at 3 PM and will visit each Gili Island on their trip. The trip also includes a stop to snorkel and swim around in the ocean near Gili Islands and watch the sunset from the deck afterward. A perfect chance to socialize with fellow backpackers while enjoying some good booze and music while surrounded by the splendid ocean view. Thus, get yourself pretend like the queens and the kings on the Gili’s boat. In the past, the Gili Trawangan is popular as the haven to get high. Some visitors smuggled their own weed and other hallucinogenic drugs to the island, although there are a lot of street peddlers who sold these stuff in the island. The most common hallucinogenic stuff in Gili Trawangan is the magic mushrooms. The locals sold them freely almost everywhere on the island. Some restaurants even sold these mushrooms, mixing them into various type of foods such as pizzas or omelets. These mushrooms are claimed by some locals to be growing naturally on the island, and as such can be considered legal. While we don’t know the authenticity of such claim, we advise you to be responsible for your actions during your visit. For a reminder, the Indonesian law concerning drugs is very harsh. There are a couple places in Gili Trawangan that play a movie on the beach at night time. Most of these places are free of charge, and the shows usually start at 7 PM. Then, it must be the best unique experience to enjoy in the beach. Watching a romantic or horror movie while the waves sound clicking in must be so great. Also, you must take your lover next to you and bring them orange juice in the middle of the scenes. What a perfect dating ever! 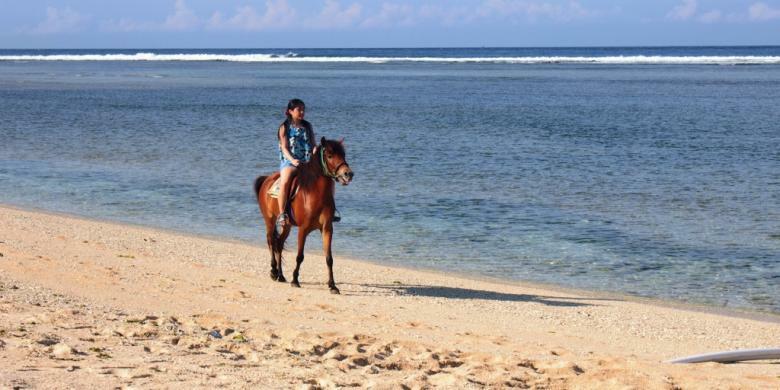 Suitable for groups of families, horseback riding along the beach will surely give you an unforgettable sensation. Enjoy the splashes of water as your horse galloped towards the sea. Meanwhile, it’s must be like movie scene where you ride the horse on the sandy day. That’s so beautiful. Then, you must be taking a thousands picture or just run away with the horse. Visitors can now enjoy the latest underwater ride called Subwing in Gili Trawangan. Subwing is a wing-like equipment which is drawn by the motorboat above the water. It is almost similar to a submerged parasailing. You can traverse the underwater easily with these exciting ride. Thus, there are many things to do in Gili Islands Bali Indonesia. While all that things meant beautiful for your holiday started with all beautiful beaches, scenes, and the never ending party. As a result, here are more lists of great Gili islands attractions you must visit. Things to do in Gili islands Lombok Indonesia? The night market hosts a ton of street food peddlers and hawkers during the night time. The food in here are excellent for such a cheap price and comes in a wide range of selection. The selection of dishes in this market includes, but not limited to, fresh seafood, meat skewers or satay, various rice and noodle dishes, grilled corn on the cob, and more. The journey in Gili Trawangan won’t feel complete until you have tried eating here. Watch some turtles in their natural habitat at this sanctuary! The sanctuary provides protection for the baby turtles and eggs from wild animals. Here you can see the famed turtle-releasing event or for a small donation, you can release the baby turtle to the ocean by yourself. 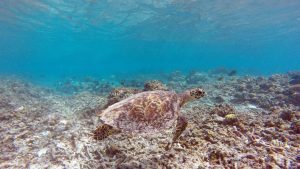 It’s on of the beautiful things to do in Gili Island Bali Indonesia to save the nature. This famous reggae bar is known to host several renowned Indonesian musicians. The live music is notably good, with a chilling vibe of a reggae beat. Patrons of this bar are also friendly, you can enjoy making new friends easily in here. Surely a perfect place to chill out after a long, adventurous day. This bar is known as the largest Irish bar in the smallest island in the world. It is one of the first bars to ever open in Gili Trawangan. 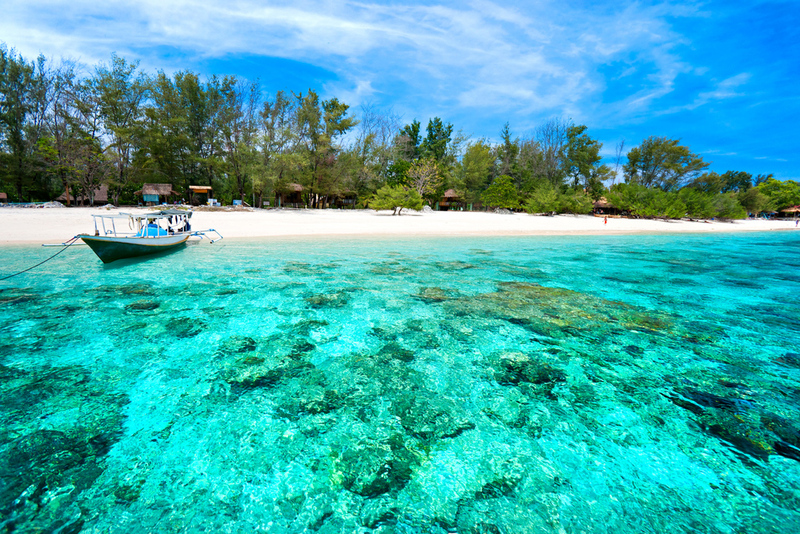 As such, it is regarded as a must-visit place if you come to Gili Trawangan. There’s a party here every Wednesday, so you might want to check it out. 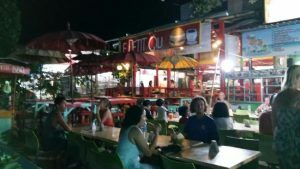 This 24-hour burger joint is absolutely one of the best spots to eat in Gili Trawangan. The food is downright delicious with a lot of options. It is a perfect place to go whether you’re looking for a normal meal, late night snacking or satiating your food craves. Their burgers are the specialty of this joint, it has a very incredible taste and comes at an affordable price. 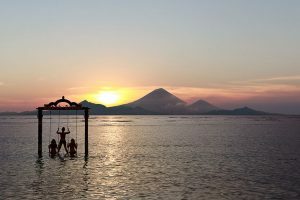 Things to do in Gili Trawangan Bali Indonesia. For better traveling experience, we have compiled several tips that might be useful during your trip. Although there are several ATM on the island, we advise you to bring enough money before you went here. Some places also accept credit card, but with an extra 3% charge. You could also make a withdrawal here using credit card cash advances, but the fee is quite steep at 7-10%. Shopping options in here are severely limited. There are some kiosks and stalls that provide basic tourist needs such as soap, sunscreen lotion, basic cosmetic, and such, but you will find a hard time finding specific items such as personal medication, children’s stuff, and more. It is best to buy everything that you might need here while you are still in Lombok or Bali. If you happen to need something important during your visit, you can ask your hotel or dive shop to help you as they make a regular trip to mainland Lombok. Gili Trawangan is known as the major nightlife entertainment. It is popular as backpacker’s island of eternal party and leisure. Still, you have to be careful during partying in here just like in anywhere else. For example, don’t leave your drinks unattended, as there are several cases of spiked drinks by unresponsible visitors. Some place sells cheap liquor that made using dubious methods, so always check your order carefully, and don’t be tricked by cheap prices. The best attraction of Gili Trawangan is to sit back, relax, and enjoy the lovely scene. Just sitting and staring into the ocean could give you a pleasant peace of mind, free from the hectic daily life. Since you are here to escape from the boring routine of your daily life, it is time for you to bask in the natural splendor of Gili Trawangan. Nah, you cannot enjoy the beauty of Gili Islands alone. You must ask your lovers whether that’s your best friends, family members, crushes, girls next door, or everyone you love to hang out with you in Gili Trawangan. They would love you even more to enjoy the beat of Gili Islands together. Meanwhile, that’s all the tips and tricks for your wild fun traveling in Gili islands. There are several ways to get into the Gili Trawangan, but all of them would require several transits. To save the hassle, we recommend that you use a tour package that is often provided at hotels or airports. Otherwise, there will be some long waits when you are waiting for the transport at some transits, not to mention the pestering hawkers that might annoy you during the wait. However, planning your trip yourself is a much cheaper option and provides better flexibility, if you know exactly what to do. Since there is no airport in the Gili Islands, visitors using plane have to land in the nearest airport, which is in Lombok, and then continue by using land transport to the nearest port that provides boat ride to Gili Islands. There are several land transport that you can use to reach these ports, such as taxi, bemo, or cidomo – a horse-drawn carriage. You can find these things easily anywhere in Lombok, especially at the airport. There are 3 main sea ports in Lombok which provide transport to the Gili Islands, one is located in Senggigi, the other one is in Bangsal harbor, and the last one is a speedboat charter in Teluk Nare. Out of those three, the speedboat is obviously the fastest and more expensive than the others. You can also take boat service from Bali to these ports, and some boat service provides a direct route to the Gili Trawangan. Alternatively, you can take a ferry from Bali to Lombok and then proceed from the ferry harbor to the aforementioned ports. However, using ferry are much slower than other transportation methods, so it is not recommended unless you really have some time to spare. Nowadays, there’s a numerous direct boat service from Bali to the Gili Islands via the Nusa Lembongan. Most of them operated around Serangan and Benoa, but you can also take it from Padang Bai or Amed. Do be careful when selecting boat operators in these ports, some of them operate without any certification and thus, are prone to safety issues and deception. We advise you to select carefully, do not base your choice on the price only. Make sure the price you pay includes everything and you don’t have to pay extra. Don’t forget to bargain on the prices. You might fetch a good price, depending on how hard you haggle.